My Doodlebug paper is pretty much decimated, but I can't tell you how exhilarated I have felt using it all month...and using it up! (still have a few sheets left though). As you know from my previous posts...this is hard for me because I love "saving my paper"...feel so bad cutting into it. But I did it! The stamp is from Northwoods (last year) and inside I stamped "I've got my eye on you" (also Northwoods). The sentiment on the front of the card is from the Studio G stamp line offered by MIchael's (this is an old old stamp though). Obviously, lots of the sparkle is coming from Stickles...but if you look very closely there is some sparkle on the doorknob and the plates on the side. This was colored in using Wink by Stella pen in silver. It is a lovely little product to have in your stash. The sparkle is very subtle but adds a really nice touch. As you can see from the door, I've cut out some of the pieces and propped them up with foam tape to make them 3D. I couldn't quite envision how to use this stamp but I think this sketch lends itself perfectly for it, don't you? Adorable card; love the sparkly ghost! Thank you for playing along with us at Crafting When We Can Make It Sparkle Challenge. 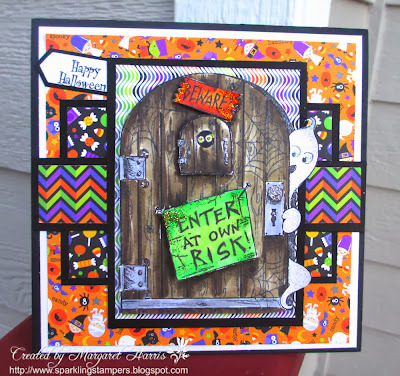 Great card - love the papers you've used and that ghost peeking round the door.